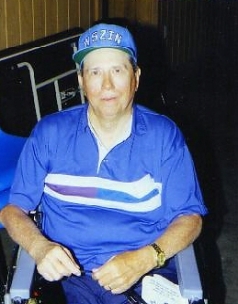 Hubert Perry, W5ZIN, was the net's first manager and contributed to the net for over fifty years serving as Net Manager, Assistant Manager and net control. 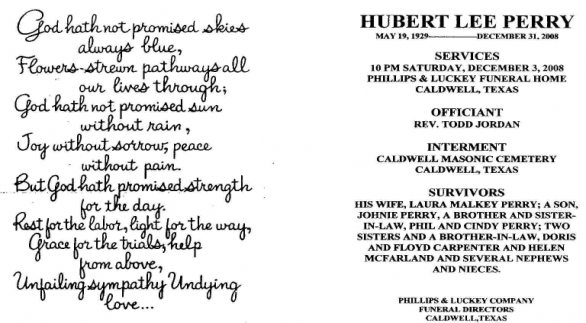 A native Texan, Hubert, lived with his wife Laura and son Johnie in the country near Caldwell, Texas. Hubert was respected in the Ham community and the 7290 Traffic Net is very appreciative of his years of dedication. This piece of electronic history can be credited with starting the 7290 Traffic Net. Hubert's account of of this photograph stated that this station went on the air for the first time in 1952. I have been asked many times, how and when was the 7290 Traffic Net started? I will try to answer that question. During the early 50's there were several MARS stations who worked the frequency 7305 KC, some of these operators had Amateur Radio licenses so were able to operate on the Ham bands. They would come down to 7290 KC and pass messages to hams who would help them deliver traffic. These MARS operators called themselves the Yankee Traffic Net. I began checking in with them as well as other Hams on the forty meter band and it got to be a fairly large gathering. Al, W5VSH decided that he wanted to begin a net so since we had been operating on forty meters, most of the time and were good friends we decided to start a net on 7220 KC and called it the REBEL NET. Al was the Net Manager and I assisted him for a time. I would go back and forth from 7290 to 7220 and help where I could. Finally I found myself spending most of my time on 7290 KC and was asked to be Net Control. By November of 1953 I was asked to take over the Yankee Traffic Net completely. With the encouragement of the other Hams who were helping on the net, I was asked to make up a set of rules and regulations to run the net by. Also it was determined that we should rename the Net and we finally settled on The 7290 Traffic Net. I acted as Net Manager for several years and in the beginning I operated as Net Control each week day from 9 until 11 AM in the morning and from 1 until 3 each afternoon. Some may think that this was a great load but to me it was a joy since I hammed almost all day anyway. If the net wasn't going on, I was in QSO with a group somewhere on the band. After awhile I got other operators to become Net Controls and I only handled the net 2 or 3 times a week and acted as a substitute when needed. I wish I had my old logs so that I could list all the hams who were so great help and who were as much responsible for this net being in existence as I. Some were W5BTH, W5SMK, W5GSN, and many many more. I wish all of them could be present and see how the Net we organized has continued to be, just as we imagined it should be. I never thought that here in October 1992 I would be present and still able to be a Net Control on the net. Many wonderful hams have carried on the net and I know I could never thank them enough. Bea K5BNH did a very good job of listing the Hams who acted as Net Controls and Managers over the years. She is to be commended for leaving a History of the Net for others to read when we are silent keys. It was one of my greatest joys to go to the 7290 Traffic Net picnic in April of 1991. Many of the hams who I got to know over the years stopped by the house over the years and I will always treasure those memories. One group of hams you never hear of any more and I am very sorry that we don't and that is the WHOOT (Women Ham Operators of Texas). They were a great source of assistance on the net as well as in other ventures. I believe it was in 1958 that they took up a collection and bought me a folding wheel chair and presented it to me at the State Fair of Texas. A bunch of these ladies are still active occasionally but I assume are mostly taking care of grandchildren now. 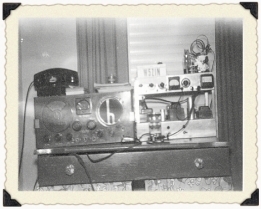 When I first received my license, my rig was a home brew 10 watts with an old S-20R receiver. The rig I used a net control was a home brew 100 watts with a pair of 807's. Until I won the SX-101A in a contest, that was the rig. I hope that all the net members realize how much I think of them & appreciate what they have done. Where do you begin and how do you say a few words about someone who has touched so many lives including mine. Hubert seemed to know everyone on the air and was encouraging and always friendly, especially to newcomers. He also had a dry sense of humor that always amazed me. He was a big part of the reason our net is more than a bunch of Hams that get together to pass messages, we are a big family. We will miss greatly his never complaining, friendly voice on the air but I will miss most hearing the way he identified himself in his slow, soft voice, this is W5ZIN in Caldwell, Burleson County in the Republic of Texas. If you would like to hear the on the air memorial that was given by our Net Chaplain, Fred N5XID on January 9, 2009, you may now listen to it by clicking the below link.